When a friend is hurting or going through a difficult time, most women send a card or take that friend to lunch. But women who sew stitch something. And as you know, I sew. Thus, when a dear friend was slammed hard and fast with a truckload of woes, I went to my beloved Brother Duetta (4500D) to offer some small measure of comfort and support.My stash is well stocked with a variety of blank items for embroidery. 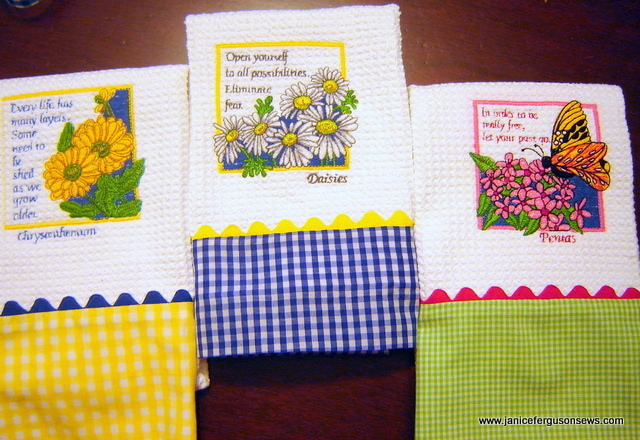 I selected three plain white microfiber dishtowels and sought the floral designs and encouraging words in the Amazing Designs collection Inspirational Concepts collection. But wanting a little more pizzazz than just the lovely embroidery designs could generate, I added rick rack and a bright gingham hem. I used the tube turn pillowcase hem technique, also known as the enchilada contrasting hem. Some time ago, I wrote an article for Creative Needle magazine showing the technique on two pillowcases. But it is applicable to almost any contrasting hem situation. A subsequent issue featured a charming guest towel made by Dianne Boney. That got me thinking. These towels fixed none of my friend’s problems, but it showed that I cared. Sometimes, that is all we can do. This entry was posted in home dec, machine embroidery, turn tube hem and tagged enchilada hem, friend gift, home dec, inspiration dishtowels, inspirational concepts, machine embroidery, turn tube hem. Bookmark the permalink. Hi Terry, I made the rick rack and hem 1″ wider than the towel. Then I centered the towel so that 1/2″ of gingham and rick rack extended beyond each side edge of the towel and pinned it all together. After stitching the seam and turning the tube, I pressed the 1/2″ raw edge to the inside of the hem and hand whipped it closed. I hope this is clear. Don’t hesitate to ask if you have any questions if it is not.